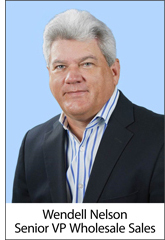 LOS ANGELES, CA – July 23, 2018 – AireSpring, the award-winning provider of cloud communications and managed connectivity solutions, is pleased to announce that telecom industry veteran, Wendell Nelson has joined the company as its Senior VP Wholesale Sales. As a key member of the AireSpring management team, Mr. Nelson will draw upon his 25 year career in the industry to support the continued momentum AireSpring is experiencing in both its domestic and international wholesale business. In his new role, Mr. Nelson will lead AireSpring’s wholesale team to maximize opportunities within AireSpring voice and data services, both domestically and internationally. Additionally, Mr. Nelson will spearhead AireSpring’s expansion into new markets and opportunities as he further develops the wholesale team. Throughout his extensive telecom career, Mr. Nelson has built a reputation for success as an executive in corporate development, mergers and acquisitions, finance, engineering, sales and operations. Most recently, he served as Vice President of Corporate Development at TailWind Voice & Data, assisting them with expanding their opportunities beyond national technical support and dispatch services and into the connectivity business. Prior to that, he held the position of SVP Wholesale Sales at Global Capacity, (formerly MegaPath and Covad Communications) where he ran wholesale sales for over eight years. Founded in 2001, AireSpring is an award-winning provider of cloud communications and Managed Connectivity solutions, serving thousands of businesses nationwide. AireSpring provides fully managed and connected end-to-end, next-generation solutions for multi-location enterprise customers. Services include SD-WAN, AirePBX™ Cloud Business Phone Systems, AireContact® Cloud Contact Center, SIP Trunking, MPLS, Disaster Recovery, Managed Security, and Business Internet. AireSpring’s solutions are offered through a diversified network of channel partners that includes distributors, master agents, managed service providers (MSPs), and value added resellers (VARs). AireSpring’s services are delivered over its revolutionary nationwide MPLS Mesh network, providing customers a fully integrated, end-to-end solution from a single vendor.